This project is a perfect example of what I imagined February Fun month to be. 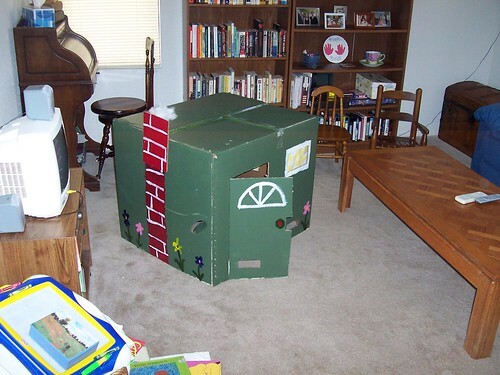 My friend Meg has made the most adorable play house out of a cardboard box I have ever seen. She even decorated the interior. Usually when I have made houses from cardboard boxes I cut out the windows and door and call it a day. Meg puts me to shame with her mad crafting skillz. Look at that? I should have brought it to New York to stay in. Don’t have a large cardboard box? Many appliance stores will happily give them away to you. I know that there is one near us that routinely has large refrigerator sized boxes sitting out front, just hoping someone will come and take them away. My children think that anything they make that they can also eat, is the best thing ever. Today we made licorice bracelets. I bought a package of Twizzlers, the kind that you can unravel into licorice strings. Then I put out a bowl of Cheerios and let them string the Cheerios onto the licorice. If I were going to do this again, I would forgo the “healthy” Cheerios and buy Fruit Loops. Who am I kidding, it isn’t like this is a healthy snack. The larger holes in Fruit Loops would make it easier to string them onto the licorice. Many of the Cheerios wouldn’t fit and had to be eaten, or thrown on the floor in disgust. I should probably address this here. Mix a few drops of food coloring, (you really don’t want to use too much since it needs to dry and stick onto the rice, not stay wet and rub off on your hands,) with a couple of teaspons of rubbing alcohol in a large ziploc bag. Take a couple of cups of dry UNCOOKED white rice and toss it into the bag with the food coloring mixture. Pour the rice out onto a tinfoil lined baking pan and let it dry. Plan for it to take half a day to dry. Of course this varies based on the tempertaure and humifity in your house. After it dries I mix in a couple of more cups of white rice to have color variation. To be honest I think this initially happened because I didn’t have enough colored rice to fill the plastic tub and didn’t want to make more. But it works. Even though it seems like it might be a pain to make, it lasts forever. I still have the same batch I made at least five years ago. My younger children love playing with this. What is it? A plastic tub, colored rice, and assorted plastic bottles, measuring cups, funnels, whatever is laying around. It is a great tactile activity and facilitates sensory exploration. To use my big educational-eese words. My toddler age children love running their fingers through the rice and pouring it from container to container. For the slightly older children, I like to give them containers of various sizes and ask them to hypothesize which container they think holds more… the tall skinny one, the short wide one, etc. And then have them test their theory. I really like it because the dry rice is easy to clean up afterward. If you put down a plastic tablecloth underneath the children and the table you can scoop the rice up and back into the plastic tub. I don’t know if it actually is “family fun month,” but February, despite it’s shorter than normal length, has always felt so long. So cold. So wintery. Unlike March, the promise of spring isn’t right around the corner. It is the month where you really begin to feel cabin fever. So this month I thought I would post everyday with a different idea of things to do with your children. Projects, crafts, or ideas that you can use at your own house, most likely with things you already have, or can easily pick up on your next trip to the grocery store. And if you have children you know you are always at the grocery store. A month of ideas to keep the boredom at bay, at least for an hour or two. I frequently get email from people asking me what I do with my younger children when the older ones are doing schoolwork. How do I keep them occupied? I will be sharing some of these ideas this month. Join me in reclaiming February. No longer will it be the month that you want to run naked screaming out of the house. Now it will be family fun month. And we will have fun, dammit. You are currently browsing the A Year Off weblog archives for February, 2007.